A Wesley Thomas double saw Cheltenham come from behind to see off Crewe. Crewe led when Patrick Ada smashed in a fine volley but the Robins levelled when Thomas fired in at the back post after a Brian Smikle shot was saved. The home side went ahead just before the break when Thomas pounced after another Smikle shot was half-saved. Calvin Zola lashed in the visitors' second to level against the run of play but Jeff Goulding's sharp turn and low drive won the game for Cheltenham. Home keeper Scott Brown produced a point-blank save to deny Shaun Miller a headed equaliser and Westwood's through-ball eluded everyone and hit the post in the final minute. "It was exciting, it was a little bit nervy at the end, but they [Crewe] had got nothing to lose, they were trying to get back in the game. If we'd have made better decisions, we'd have killed them off. "I was pleased with the performance and I think that the supporters have got something that they can get behind and be excited by. "I thought we played some great stuff, Crewe are a renowned passing team and like to stroke it around and open you up and I think we did exactly that to them." 95:06 The ref blows the whistle to begin the match. 90:00+2:56 Substitution Jeff Goulding goes off and Robin Shroot comes on. 90:00+2:41 The ball is delivered by Danny Blanchett, Lee Bell has a headed effort from close in and clears the bar. 90:00+1:26 Outswinging corner taken by Ashley Westwood. 90:00+0:53 Outswinging corner taken by Ashley Westwood, clearance made by Steve Elliott. 90:00+0:13 Corner taken right-footed by Ashley Westwood from the left by-line, Steve Elliott makes a clearance. 89:04 Shaun Jeffers challenges Patrick Ada unfairly and gives away a free kick. Direct free kick taken by Patrick Ada. 88:36 The official flags Patrick Ada offside. Scott P Brown takes the direct free kick. 88:08 Free kick awarded for an unfair challenge on David Artell by Keith Lowe. Lee Bell takes the free kick. Correction - 86:53 Shaun Jeffers sends in a cross. 86:53 The ball is swung over by Shaun Jeffers. 85:51 The ball is sent over by Ashley Westwood, save by Scott P Brown. 84:10 Free kick taken by Ashley Westwood. 84:10 Substitution Nick Powell replaces Clayton Donaldson. 84:10 Free kick awarded for a foul by Steve Elliott on Calvin Zola. 83:37 Frankie Artus takes a shot. 81:43 The ball is sent over by Lee Bell, save made by Scott P Brown. 80:55 The ball is delivered by Patrick Ada, clearance by Keith Lowe. 79:33 A cross is delivered by Matt Tootle, Calvin Zola takes a shot. Scott P Brown makes a save. 76:17 Free kick awarded for a foul by Patrick Ada on Shaun Jeffers. The free kick is delivered left-footed by Danny Andrew from right by-line, clearance by Calvin Zola. 74:43 A cross is delivered by Matt Tootle, Shaun Miller takes a shot. Scott P Brown makes a save. 72:32 Frankie Artus concedes a free kick for a foul on Lee Bell. Rhys Taylor takes the direct free kick. 71:41 Substitution Shaun Jeffers joins the action as a substitute, replacing Wesley Thomas. 71:09 Matt Tootle crosses the ball, clearance by Danny Andrew. 69:21 Frankie Artus crosses the ball, Rhys Taylor makes a save. 69:05 Frankie Artus takes a shot. Save by Rhys Taylor. 67:55 Keith Lowe delivers the ball, save by Rhys Taylor. 67:32 Unfair challenge on Joshua Low by Luke Murphy results in a free kick. Steve Elliott restarts play with the free kick. 66:11 Outswinging corner taken right-footed by David Bird played to the near post, Clayton Donaldson manages to make a clearance. 65:40 Foul by Danny Andrew on Matt Tootle, free kick awarded. The free kick is swung in right-footed by Ashley Westwood. 63:43 The ball is crossed by Michael Pook. 61:29 Assist on the goal came from Wesley Thomas. 61:29 GOAL - Jeff Goulding:Cheltenham 3 - 2 Crewe Jeff Goulding fires in a goal from inside the penalty area low into the middle of the goal. Cheltenham 3-2 Crewe. 60:18 Effort from outside the area by Frankie Artus goes wide right of the goal. 59:51 The ball is delivered by Danny Blanchett, save by Scott P Brown. 58:48 Lee Bell challenges Frankie Artus unfairly and gives away a free kick. Direct strike on goal from the free kick comes in from Michael Pook, save made by Rhys Taylor. 54:49 Corner taken left-footed by Danny Andrew from the right by-line, Header from deep inside the area by Keith Lowe goes harmlessly over the crossbar. 53:44 Jeff Goulding gives away a free kick for an unfair challenge on David Artell. Rhys Taylor takes the free kick. 52:56 Free kick taken by Scott P Brown. 52:56 Booking Calvin Zola is given a yellow card. 52:15 Foul by Calvin Zola on Michael Pook, free kick awarded. 50:57 The ball is delivered by Danny Andrew, clearance made by David Artell. 49:37 Corner taken by Michael Pook from the right by-line. Inswinging corner taken by Michael Pook. 48:24 Assist by Ashley Westwood. 48:24 GOAL - Calvin Zola:Cheltenham 2 - 2 Crewe Calvin Zola finds the back of the net with a headed goal from inside the six-yard box. Cheltenham 2-2 Crewe. 47:58 Free kick awarded for a foul by Michael Pook on Clayton Donaldson. Ashley Westwood takes the direct free kick. 45:30 David Bird delivers the ball. 45:00+2:35 The ball is crossed by Calvin Zola, Joshua Low makes a clearance. 45:00+1:38 Centre by Matt Tootle, save by Scott P Brown. 45:00+0:52 Danny Andrew takes the inswinging corner, Calvin Zola manages to make a clearance. 44:54 Foul by Steve Elliott on David Artell, free kick awarded. Rhys Taylor takes the free kick. 43:59 Outswinging corner taken right-footed by Ashley Westwood, Patrick Ada challenges Keith Lowe unfairly and gives away a free kick. Scott P Brown takes the free kick. 41:58 Brian Smikle takes a shot. Blocked by Rhys Taylor. 41:48 GOAL - Wesley Thomas:Cheltenham 2 - 1 Crewe Wesley Thomas finds the net with a goal from inside the six-yard box to the bottom right corner of the goal. Cheltenham 2-1 Crewe. 39:35 Danny Andrew challenges Matt Tootle unfairly and gives away a free kick. Strike comes in from Ashley Westwood from the free kick. 39:22 Foul by Keith Lowe on Clayton Donaldson, free kick awarded. Clayton Donaldson restarts play with the free kick. 38:34 Shot by Clayton Donaldson from deep inside the penalty area misses to the right of the goal. 36:50 The referee blows for offside against Jeff Goulding. Rhys Taylor restarts play with the free kick. 36:03 Direct free kick taken by Rhys Taylor. 36:03 Booking Wesley Thomas is booked. 35:48 Foul by Wesley Thomas on David Artell, free kick awarded. 35:20 The official flags Clayton Donaldson offside. Scott P Brown takes the free kick. 34:27 Shaun Miller is flagged offside by the assistant referee. Scott P Brown restarts play with the free kick. 31:22 Corner taken right-footed by Michael Pook from the left by-line, Rhys Taylor makes a save. 29:49 David Artell fouled by Frankie Artus, the ref awards a free kick. Rhys Taylor restarts play with the free kick. 29:33 Substitution David Bird is brought on as a substitute for Martin Riley. 27:49 Centre by Danny Andrew, David Artell makes a clearance. 26:17 The ball is swung over by Keith Lowe, save by Rhys Taylor. 25:56 Foul by David Artell on Jeff Goulding, free kick awarded. Steve Elliott takes the free kick. 24:53 David Artell fouled by Wesley Thomas, the ref awards a free kick. Direct free kick taken by Rhys Taylor. 24:14 Joshua Low has an effort at goal from outside the box which goes wide right of the goal. 22:58 Michael Pook takes the inswinging corner, David Artell makes a clearance. 22:47 Frankie Artus takes a shot. Save made by Rhys Taylor. 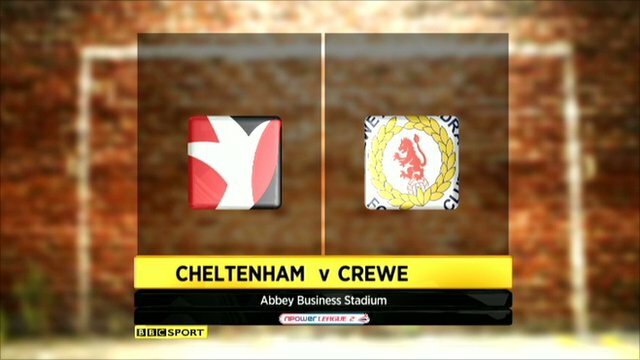 21:30 GOAL - Wesley Thomas:Cheltenham 1 - 1 Crewe Goal scored by Wesley Thomas from inside the six-yard box to the top right corner of the goal. Cheltenham 1-1 Crewe. 20:39 Wesley Thomas fouled by Patrick Ada, the ref awards a free kick. Shot on goal comes in from Danny Andrew from the free kick, Rhys Taylor makes a save. 19:18 Ashley Westwood crosses the ball. 18:33 The ball is crossed by Clayton Donaldson. 17:24 Ashley Westwood gives away a free kick for an unfair challenge on Frankie Artus. Free kick taken by Steve Elliott. 16:13 Danny Andrew takes a inswinging corner from the right by-line to the near post, clearance made by Danny Blanchett. 15:06 Free kick awarded for a foul by Patrick Ada on Wesley Thomas. Danny Andrew produces a shot on goal direct from the free kick, Rhys Taylor makes a save. 13:57 Handball by Clayton Donaldson. Direct effort from the free kick comes in from Frankie Artus. 13:29 Calvin Zola is adjudged to have handled the ball. Scott P Brown restarts play with the free kick. 12:39 Michael Pook sends in a cross, Header from close range by Steve Elliott misses to the right of the target. 11:53 Michael Pook takes the inswinging corner, Patrick Ada manages to make a clearance. 10:57 The referee penalises Calvin Zola for handball. Free kick taken by Scott P Brown. 10:45 Frankie Artus takes a shot. Save made by Rhys Taylor. 8:34 Inswinging corner taken left-footed by Frankie Artus, Unfair challenge on Rhys Taylor by Wesley Thomas results in a free kick. Rhys Taylor takes the free kick. 8:27 Frankie Artus delivers the ball, clearance made by Patrick Ada. 6:47 The ball is delivered by Keith Lowe, Effort from deep inside the area by Wesley Thomas misses to the right of the target. 6:06 Matt Tootle sends in a cross, Michael Pook manages to make a clearance. 5:47 A cross is delivered by Danny Blanchett. 3:21 Assist by Ashley Westwood. 3:21 GOAL - Patrick Ada:Cheltenham 0 - 1 Crewe Patrick Ada grabs a goal from deep inside the penalty box high into the middle of the goal. Cheltenham 0-1 Crewe. 0:57 Inswinging corner taken by Michael Pook from the left by-line, Calvin Zola makes a clearance. 0:28 Joshua Low crosses the ball, Wesley Thomas takes a shot. Save by Rhys Taylor.